Topic: Mini 2 with OctoPrint? Thx. Good idea re power. However, I use a separate power supply. That said, I think it would be pretty easy to find a 5V rail. After 3 painful days... I got TouchUI working on my Lulzbot Mini with OctoPi. 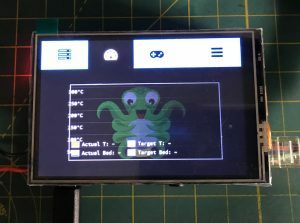 If anyone is interested in doing this, you can add a TFT for $21 (CAD) to your Pi and get TouchUi running. Here's my write-up. Thx for the ideas.. Although I could probably figure that out, I'm getting lazy in my old age.. Hoping for a simpler soln.. Lets see if others have tried. Not sure where you live in Canada, but I get my PLA from Sayal. They sell the MG Chemicals branded stuff. Very happy with it. I print at 205c and always get good prints (black, orange, purple). They have lots of stores in GTA..